When Doug Rose founded Aero Gear in 1982, he envisioned a company that would provide solutions-focused expertise in the design, engineering and manufacturing of gears and gearbox assemblies for the global aerospace industry. What he determined would make Aero Gear stand apart from the rest was – experienced personnel in all departments, best manufacturing practices that would encourage efficiencies, and robust process control systems. Power drive gear systems for fixed and rotary wing aircraft, are as essential as the combustor that creates the thrust for the engine… the “brain” behind the brawn. The recognition of this level of importance has always driven Aero Gear to new heights of performance, from design capabilities and prototyping gear development to advances in manufacturing through Continuous Improvement initiatives. We fully understand our customer’s needs, wants and expectations, and strive to exceed them all. Our goal is to utilize knowledge based expertise to practical benefit, so as masters of our trade we are able to offer superior product development and support service, whether for gearbox assemblies or individual gears. The overall majority of our Lean Flow processing is conducted within our modern climate controlled 69,000 sq. ft. facility, including unique gear processing capabilities such as carburized and hardened heat treatment, superfinishing, balancing, and non-destructive testing, which enables us to offer significantly shorter lead times, excellent quality control, with greater efficiencies and improved customer service. 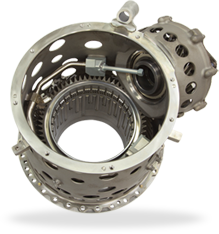 This performance return and our ability to meet demanding requirements in both the engineering and manufacturing processes, has led to a broad reaching list of customers including major engine manufacturers and many Tier 1 suppliers. Our wish is to build strong, long term partnerships with our customers by achieving superior standards through the excellence and expertise of our dedicated employees.